Earlier this year, the Regional Animal Protection Society opened the RAPS Animal Hospital — a full-service, state-of-the-art veterinary facility located in the Richmond Auto Mall. 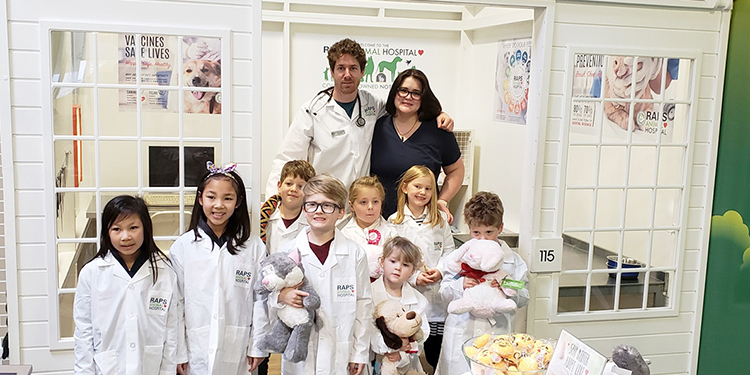 A few days ago, another RAPS Animal Hospital opened – a replica at the World of Kidtropolis that allows kids to imagine themselves as veterinarians. Kidtropolis, located on No. 2 Road near the Richmond Oval, is an interactive city model designed to provide a safe, unique and realistic educational environment that lets kids to do what they do best: pretend play. Kidtropolis is a cityscape of pretend urban fixtures, including a grocery store, a bank, a school, a dental office, a pizzeria and more … And now, there is a RAPS Animal Hospital, too. Ginny Lam, President CEO of Kidtropolis, welcomed RAPS Animal Hospital to the community. At the Grand Opening on Nov. 17, kids donned veterinary coats and stethoscopes while exploring the freshly opened mini-hospital. Pat Johnson is communications director of the Regional Animal Protection Society, RAPSbc.